Here's my card for this week's challenge at The Paper Players. I used the sketch and a super sweet donut image from Mama Elephant to put together this mostly monochromatic birthday card. The donut image was colored with Copic markers, then cut out with my Brother Scan 'n Cut machine. 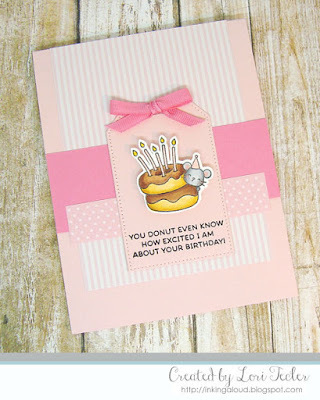 I used foam tape to adhere the image to a pale pink pierced tag die cut. The birthday sentiment was stamped just beneath the image in black ink. I topped the tag with a rosy pink bow that I tied with my Bow Easy. 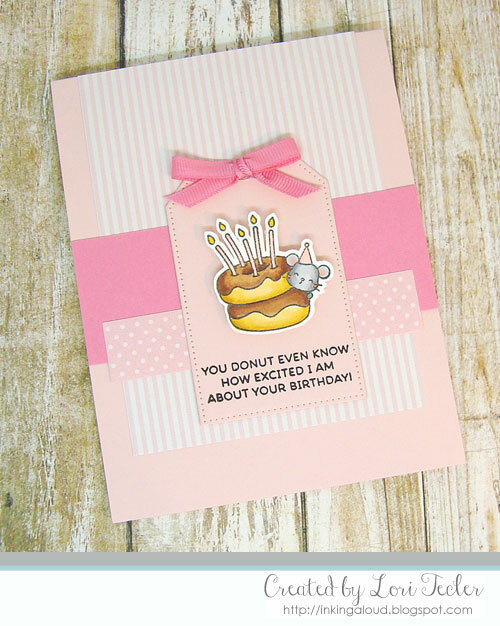 For the background, I adhered a pink striped panel to the top of a pale pink card base. A pair of pink strips--one solid rose and one pink polka dotted--were adhered over the striped panel, stretching across the cardfront. I added the tag on top to finish the card. Awww...This is just so darling! Lori... love this birthday card! The pinks are wonderful! Thanks so much for joining us this week at The Paper Players! This is just adorable..what a sweet image!Thanks for playing along at The Paper Players this week!